This is a double review highlighting a discussion between the awesome Ninja Jenny (NJ) and the fantastic Ninja Amy (NA). This book is out June 11, 2009. NJ: When the Whistle Blows is a book that lets us look into a small window of Jimmy Cannon’s life. We see every All Hallow’s Eve from 1943 to 1949, showing Jimmy the boy concerned with scare tactics in the school graveyard growing up into Jimmy the man, concerned with the future of his life, college, his family, and better knowing himself. The book is full of adventure and pure-heartedness. Jimmy will be a character many young, teenage boys will relate to! NA: I think my favorite thing about this book is how each chapter is a different year in Jimmy’s life. It’s not a very long book, but you still get to see so much of Jimmy’s life and how he changes and the people around him change. Also, I was surprised by how much humor there is in the story. There were a lot more funny parts than I expected. NJ: Yes, there was quite a bit of humor! Author Fran Slayton wrote Jimmy as a very well rounded character. With a book that includes launching rotten cabbages at cars, how can you not expect humor!? But I think the real subject here is true living. Glances into Jimmy's life also show us how the town of Rowlesburg grows and suffers through new train technology. There are multiple levels working in this book, though not a single one would turn off a reader. The various aspects of the book just draw the reader in further to town life and Jimmy's experiences of laughter, love, and loss. NA: Loved the bit about the cabbages, and also the bit where a certain group tried to make sure all the kids would be able to make it to the first day of hunting season. There are definitely many layers to this book, which means a lot of different types of readers will enjoy it. If you want humor, it's there. If you want history, it's there. If you want mystery, that's there, too. And I think I should mention that for people like myself who don't usually enjoy historical novels, this book is a good one to try because you don't get bogged down with all the usual historical novel type details. This is a book that, like you said, is about true living. It's about the people and the community, and that's what really makes a great story. 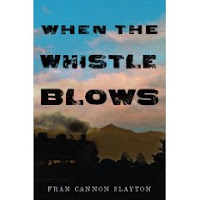 Fran Cannon Slayton's When the Whistle Blows is an excellent historical book that gives the reader a peek into a small West Virginia Train town. Jimmy is a likable character that shows his maturity with each passing chapter. Full of comedy, bits of mystery, loss, and triumph, this book is bound to attract young male readers. Recommended for middle school ages (especially boys) and any young adult reader that loves a glimpse of history through the eyes of a believable teen character.